Chelsea Welling is a completely normal fifteen year old girl… well normal except for the pesky fact that she thinks she is going crazy. Either that or she really is being transported to a magical world known locally as Amar. However when Chelsea is transported to Amar with her friend Easton, she knows beyond a shadow of a doubt that these little trips are more than figments of her imagination. Then the unthinkable happens. Chelsea, Easton, Chelsea’s brother Clint, and their mutual friend Bobby are all stranded in Amar. They cannot return to Earth until they finish a dangerous quest that their fathers set out on over twenty years ago. 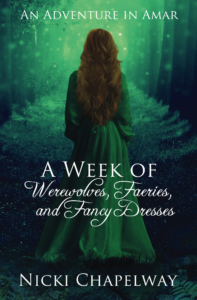 Chelsea is in for one trying week as she flees from werewolves, faces down faeries, and fits into fancy dresses- all while she struggles alongside her friends to fulfill the all-but-impossible tasks of finding out what the quest their fathers set out on was, and succeeding where their fathers failed. For as long as I can remember I have always wanted to write. I wished this even before I enjoyed reading (I actually spent the first half of my childhood hating to read and avoiding books like the plague). I believe that the desire to write was inspired by my older sister (an author herself). When I as younger she would tell me stories that took place in the books that she was writing. In my eyes these books were the coolest things in the whole wide world, and my sister was one of the smartest, cleverest, most ingenuous people I have ever known (besides my parents of course) to have come up with them. I wanted to be just like her. The only problem? While my sister was writing great works (at least to my young mind) like Julien and Juliet I was trying to write lame stories such as The Princess in the Sewer. I thought it would be a great idea to write about a princess living in a sewer (you know ignoring the whole disgusting-ness of it all). However, that was as far as I ever got. As soon as I tried to come up with the prince and the villain, or at the very least an explanation what the princess was doing living in a sewer I realized that I was in way over my head. After that I didn’t give up on writing per se but I certainly stopped trying so hard. I contented myself to simply play with myself, devising worlds and making up bad guys for myself to fight. I acted this all out, using my imagination to transform my Living Room into an enchanted forest. I devised whole worlds with interesting characters, strong heroines (played by mwa), and evil villians. Little did I know that I was world building and creating stories, something that I had previously thought impossible for me to do. Fast forward some years and now I’m eleven years old. It’s two months till my sister’s birthday and a crazy idea comes to me. I can write her a story for her birthday based off of a game we played together called The Blue Butterfly. I figured that since it was already a reasonably well-developed story I would be able to just write the story without getting caught on the thing that always got me every time I tried to write a book, my inability (or so I thought) to come up with a story and a plot all my own. But it didn’t exactly work like that, I surprised myself by taking my own path while writing the story, changing some things and developing a different plot. I was shocked that the ideas for writing a story actually came to me. Then I realized something, I had been doing this all along when I had been playing my games, and if I truly wanted to be an author I could just write what I had been playing all these years. At this realization, flood gates opened. Suddenly whole worlds- worlds that I never thought possible for me to see- were opened to me. All at once I got ideas for half a dozen books, and it seemed that everything I looked at gave me at least two other ideas. To a person who had spent her whole life up to this point in time simply languishing to come up with one doable idea this was all quite overwhelming. I no longer had problems coming up with ideas, no my problem was now quite the opposite. I wasbombarded by ideas. I spent three years simply flitting from idea to idea never able to settle on one long enough to actually write it before I was distracted by something new and shinier. 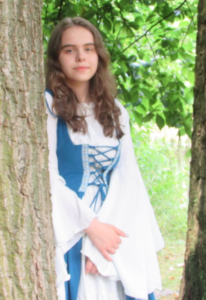 Finally the summer of my fourteenth year I sat myself down and told myself that I was going to have to come up with a book idea and stick with it until I finished it, and so My Time in Amar book one A Week of Werewolves, Faeries, and Fancy Dresses was born. Which I am so excited to have on a blog tour at Celebrate Lit. I really want to thank everyone on the Celebrate Lit team who made this possible, most especially Sandra, as well as everyone who is a part of this tour. And to all my future readers, I hope you enjoy the book! Wow! Just...WOW! The author is 15, and that is mindblowing to me! This book is really great. The storytelling is really good, and the use of imagery is impressive. Her writing style is very easy to follow, and I found the characters to be as believable as they can be given a fantasy style genre. I could see this as an older child/young adult interest novel. This is very Narnia'ish in that the character is taken to a different world, and it takes a bit of time to realize it's real. I really like the overall plot, and it's not a total giveaway, and I like that, too. Overall, job very well done. I look forward to a Book 2! Thank you so much for featuring my book on your blog and for reviewing it. I am glad that you liked it! Never fear the second book should be out soon- here's hoping by the end of the year! It's already written and just awaits publication. You're most welcome! I can't wait for the 2nd! Thank you so much for featuring my book on your site and for the review. I am so glad that you liked my book! Hopefully you won't have to wait too long for book 2 I hope to have it out by the end of the year (here's hoping that all goes well!). It is already written and just awaits publication.